Following a car accident, if you are considering bringing a lawsuit you should know that we will have to prove a standard of the preponderance of the evidence to get a verdict in your favor. This standard is less than the criminal standard of “beyond a reasonable doubt” that is used in criminal cases. 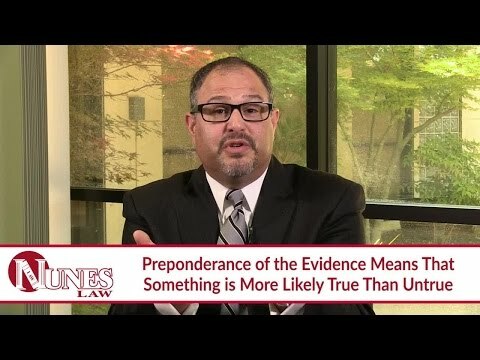 The preponderance of the evidence is the slightest standard, and it means that something is more likely than not true. In a car accident case, we are required to show that it is more likely than not that the driver was careless and their negligence caused your injuries. Watch the video to learn more. If you have additional questions regarding the preponderance of evidence standard in your case, I want you to call me at (559) 436-0850. I welcome your call. Visit our educational website at https://www.nuneslaw.com for more videos and media content from our law firm.